Yuki is an attractive Shiba Inu from upper New York State. Yuki the Enlightened Shiba Inu is hand painted with a cheerful blue background. A black and tan Shiba Inu, Yuki looks great in her portrait by Sufraj Khadka. 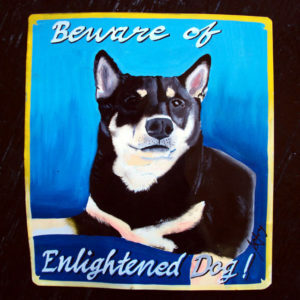 This Beware of Enlightened Shiba Inu sign is currently available at Nomad in Boston. Please contact them at (617) 497-6677, and they will be happy to assist you with your purchases. Their website is NomadCambridge.com.